Hello sweet tooth! It doesn’t take much for mine to kick in and never stop. My boyfriend got me in a really good habit of reading labels before buying any food, especially the sugar content. As you read in Kayla’s blog, Americans are addicted to their sweets. It’s my quest to find healthier ways to satisfy the craving while keeping my nutrients in check. 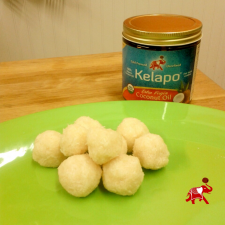 These raw coconut balls are great for several reasons. First, they are bite sized and just sweet enough you can get away with eating just one. Secondly, can you can nutrient rich? Honey naturally contains over a dozen amino acids, add that to the lauric acid which gives the coconut its anti-fungal and anti-bacterial properties and you have a one-two punch for immunity. Third, they are so easy to make and can be adapted to just about any palate. Fourth, both honey and coconut oil are known for their ability to boost energy sans chemicals. And finally – they are YUMMY! Here’s the basics you’ll need, feel free to improvise with any additional ingredients. A raw dessert too delicious for words! Place on parchment paper and put in refrigerator for one hour. Once firm, form mixture into 9 – 10 balls. Hope you enjoy this tasty treat! Can’t wait to hear what you added in to make it your own. Oh, yum! These are definitely going on the “To-Make” list!